This is an In Person Signed Colour 10" x 8" Photo of the American Professional Golfer. 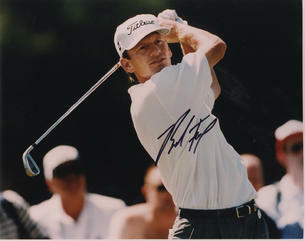 Bradford John Faxon, Jr. (born August 1, 1961) is an American golfer. Faxon was born in Oceanport, New Jersey. He attended Furman University, and turned professional in 1983. He has won eight times on the PGA Tour and played on two Ryder Cup teams. While admittedly not a great driver of the golf ball or a great ball-striker, Faxon has built a reputation as one of the best pure putters in golf history. He led the PGA Tour in Putting Average in 1996, 1999, and 2000 (when he set the single-season record with only 1.704 putts/greens in regulation), and finished 13th in 2005 at the age of 44. Faxon explains his success on the greens thus: "My only secret is confidence... I just try to hit every putt as if I've just made a million in a row."